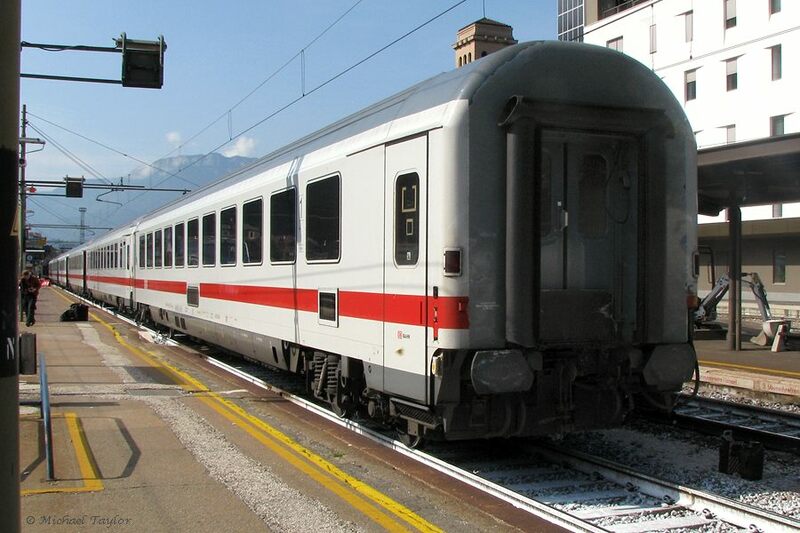 Special train 14734 "TEE Rheingold" Villach - Klagenfurt - Selzthal - Bischofshofen - Schwarzach St. Veit - Villach - Klagenfurt. 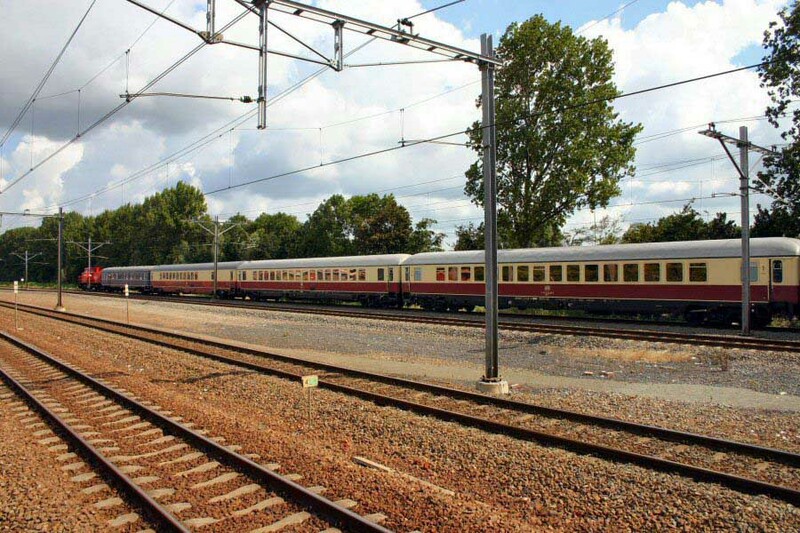 At the end you can see the 56 80 18-95 001-0 Apmz121.2, behind two Avmz 111. 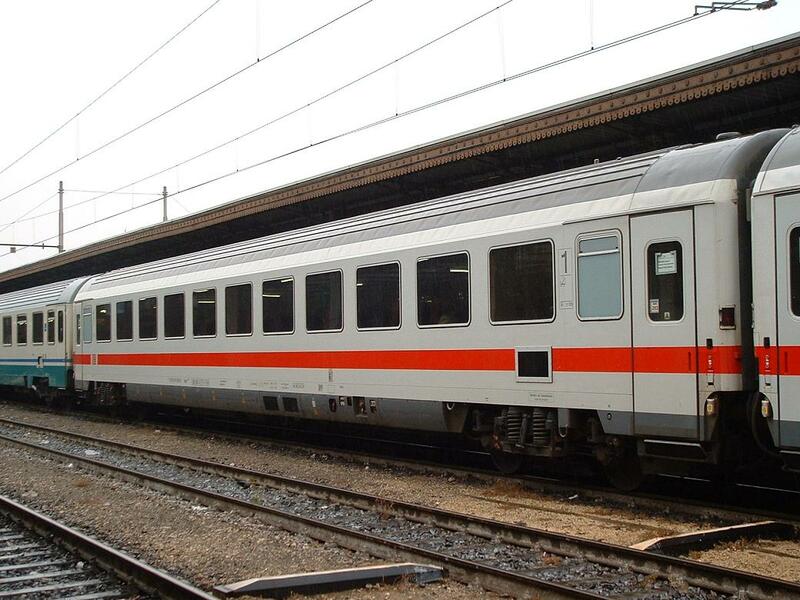 Modernized variants of these cars (in "ICE" painting and with electronic displays) can still be seen every day on this line, in the push-pull EuroCity trains Graz - Saarbrücken/Frankfurt(M). 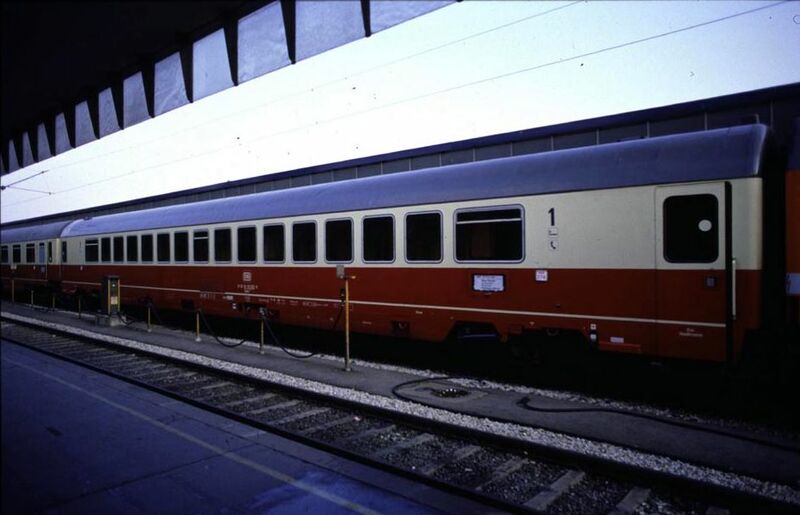 The coaches seen here are out of regular service, repainted in the 1970s TEE colours and used for special trains. Near Selzthal, 2012-05-26. 6180 18-90 501-7. 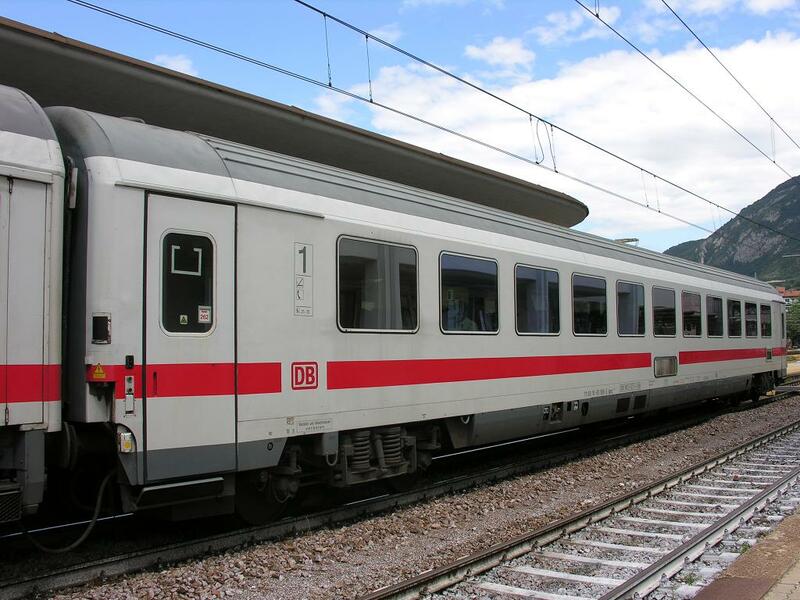 DB 1st class car (Apmz 119.5) in train EC82 (12:32 to München Hbf.) at Bolzano on Monday, September 21st, 2009. 61 80 18-94 008-9 Apmz 121.0. 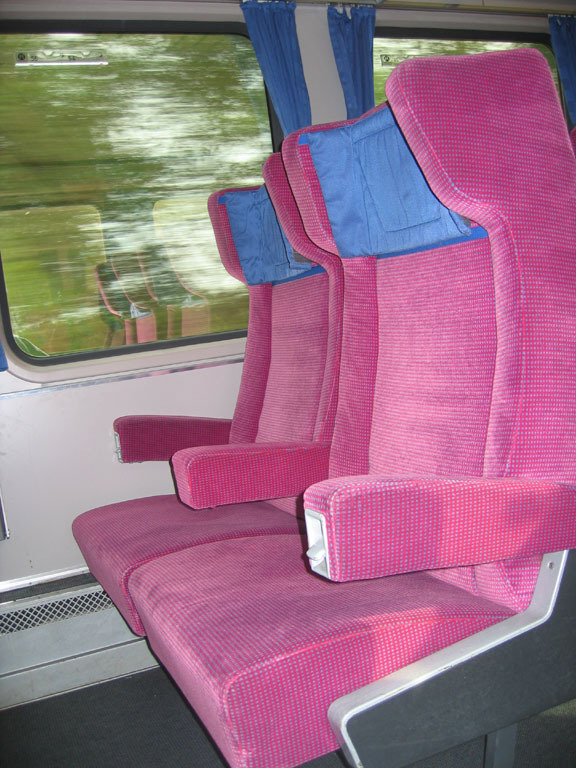 The first series built in the 1960s had rounded roof ends. 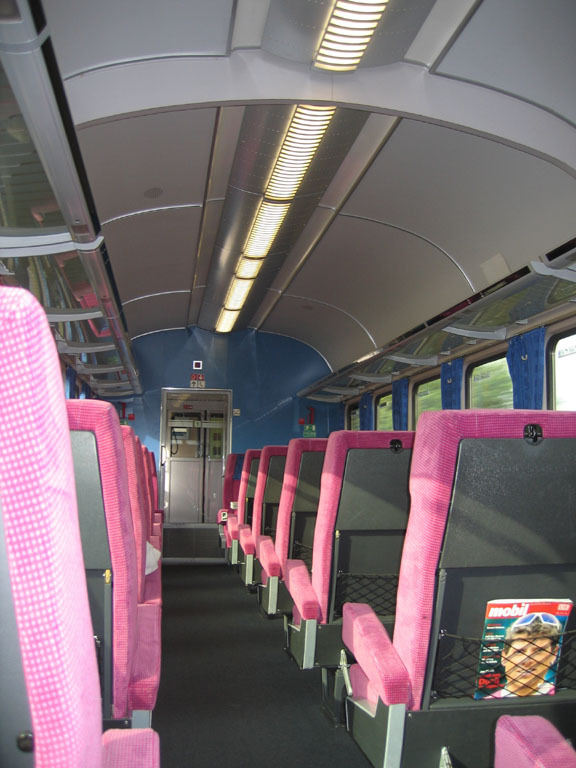 Throughout the years a lot was rebuilt: Windows, doorsteps, bogie dampers for 200 km/h, bogie generators removed, destination sign holders removed, new seat covers and so on. The coach has been repainted in the TEE livery typical for the 1970s without reversing the other changes. Selzthal, 2012-05-26. 61 80 18-94 023-8 Apmz 121.0. The first series built in the 1960s had rounded roof ends. This car even has the latest variant of emergency exit windows (which can be broken from the outside by rescue teams). 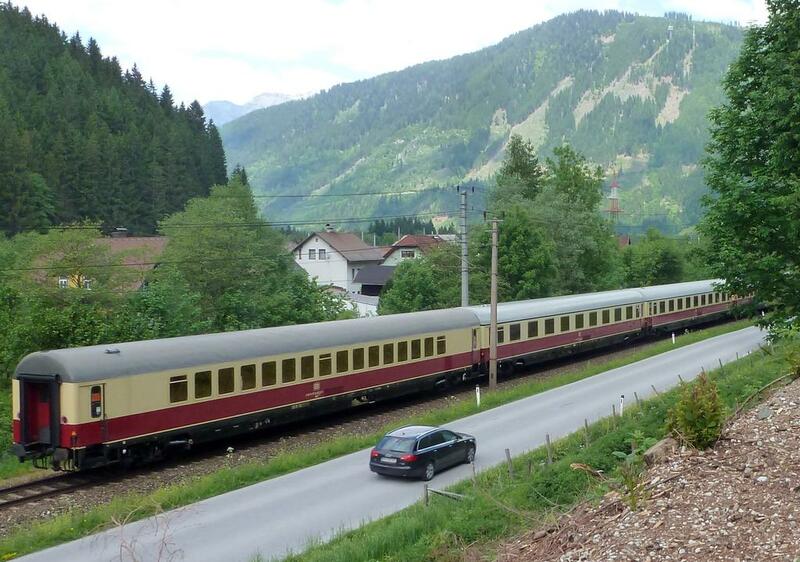 The train is the "TEE Rheingold" which took a tour of Austria on this day (with dome and two restaurants). Selzthal, 2012-05-26. EC 168/9 (Lyon Perrache--->Stuttgart Hbf), seen running down the Revermont at 110km/h, shortly after leaving the Orbagna Loop. 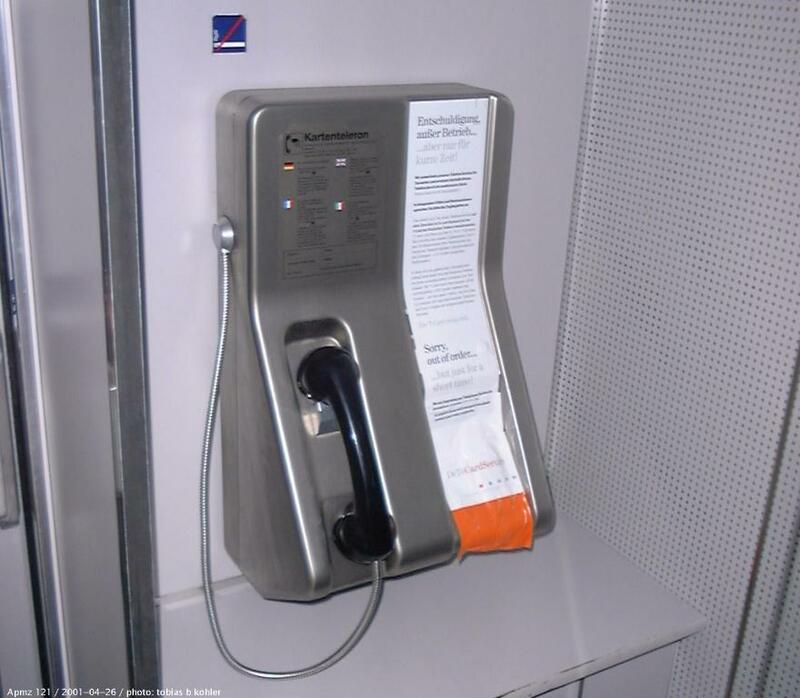 Telephone in an Apmz 121 car - sorry, out of order .... 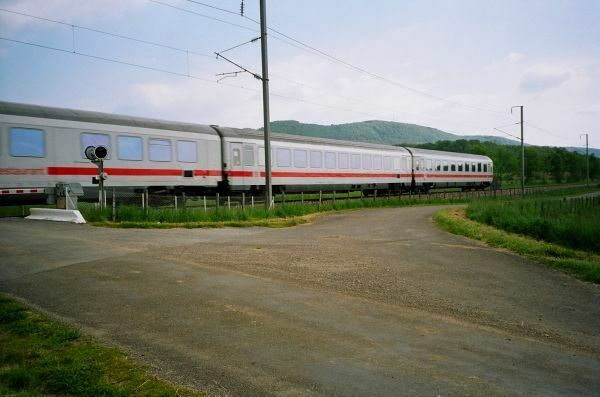 In the 1980s, the DB equipped all 1st class open plan cars of type Apmz 121 to 123 with coin-operated telephones, but when the old "C" mobile telephony network was switched off in 2000, nobody had thought of installing a suitable replacement on time, so there are currently no German trains with working telephones. A lot of passengers have their own mobile phones anyway, nowaday. 2001-04-26. 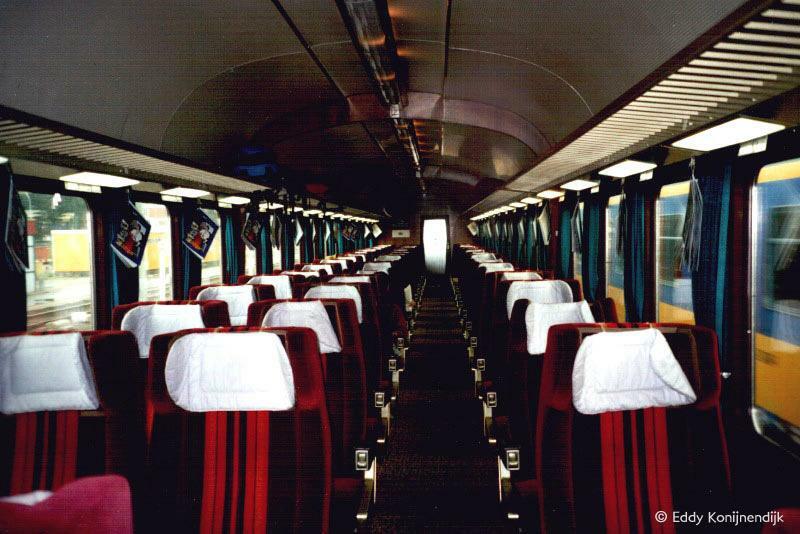 Apmz 121 car, first class open seating, in the IC 528 "Dresdner Zwinger" to Dresden, seen in Hannover Hbf, 2001-04-26. This car is painted in the latest colours, similar to the ICE, but with a darker grey roof. The red stripe doesn't look very elegant where it gets interrupted by the air intake of the air conditioning system. 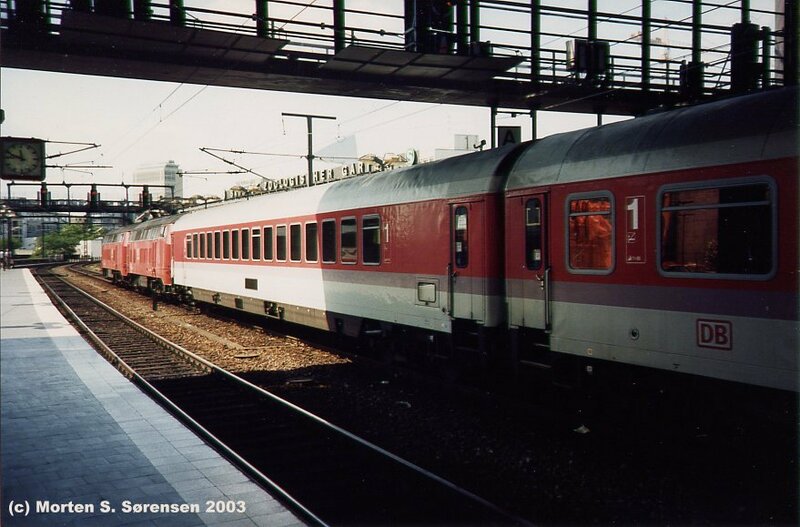 Intercityzug in Berlin Hauptbahnhof 1995. Es gab damals noch keiner oberleitungen. 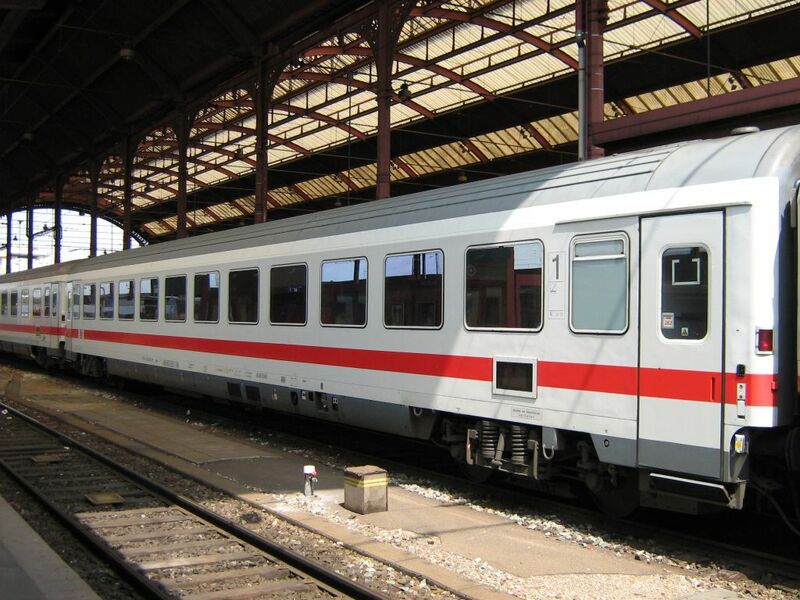 Erst angekommen, musste die E-loks mit einer BR 346 aus von der halle gezieht werden. 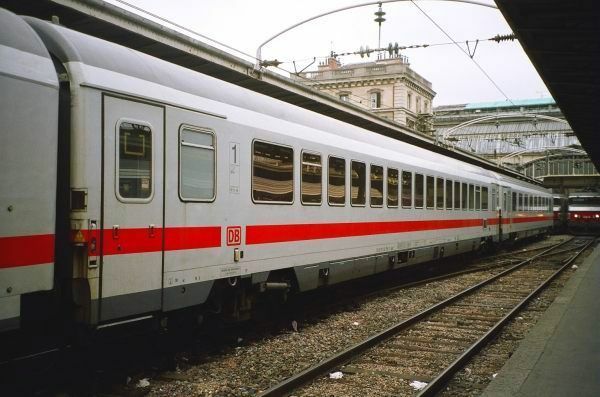 Intercity-train in Berlin Central Station in 1995. 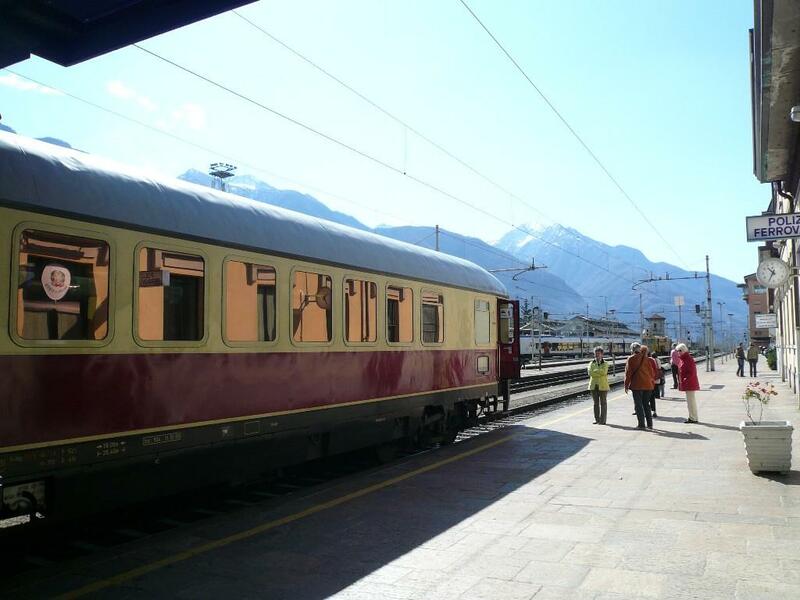 It was quite interesting to watch the arriving trains, since they had to "shut down" the Electric locomotive 2-300 meters before they stopped at the platform, since there were no electrification inside the hall...! At this time a shunter of type 346 were permanently placed here to pull out the electric locomotives. 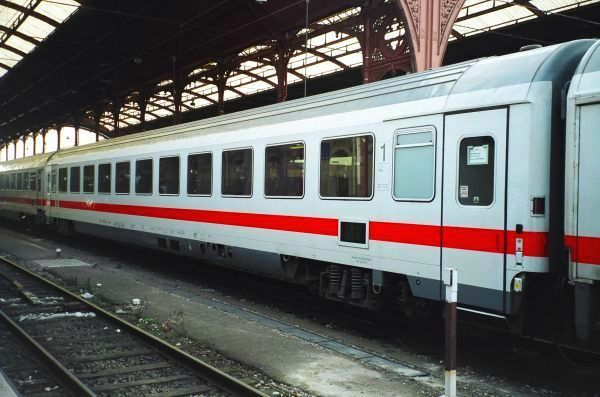 Intercityzug in Berliner bahnhof Zoo, 1995. Meiner ersten Berliner-aufnahme. 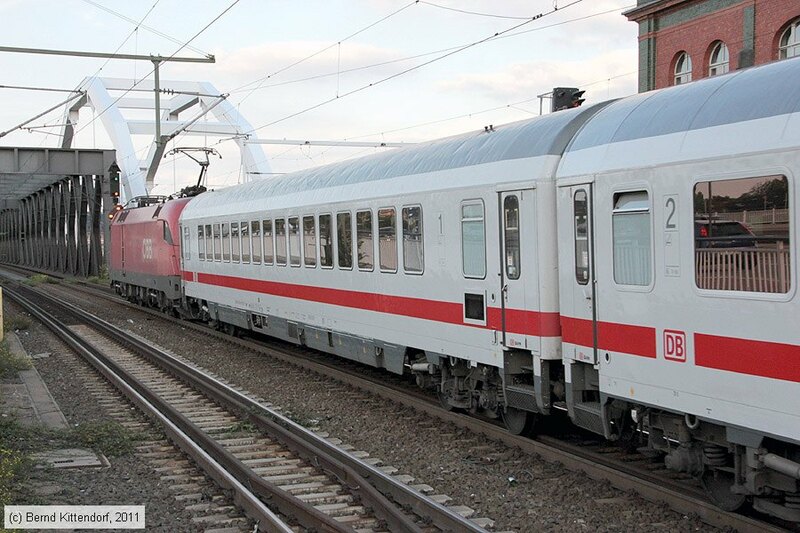 Sehr typisch war die BR 218-dobbelttraktionen vor InterCity-züge. 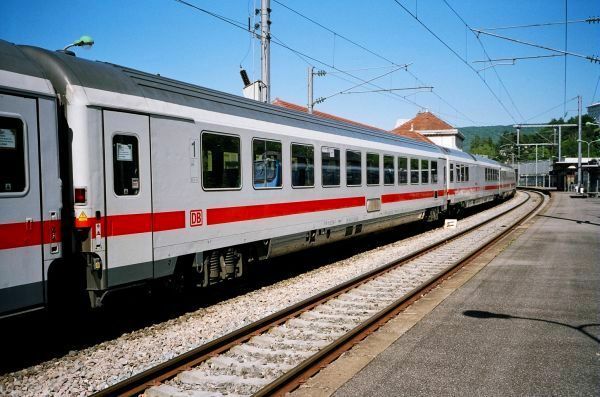 Damals gab es keine oberleitungen an teilen der hochbahn. 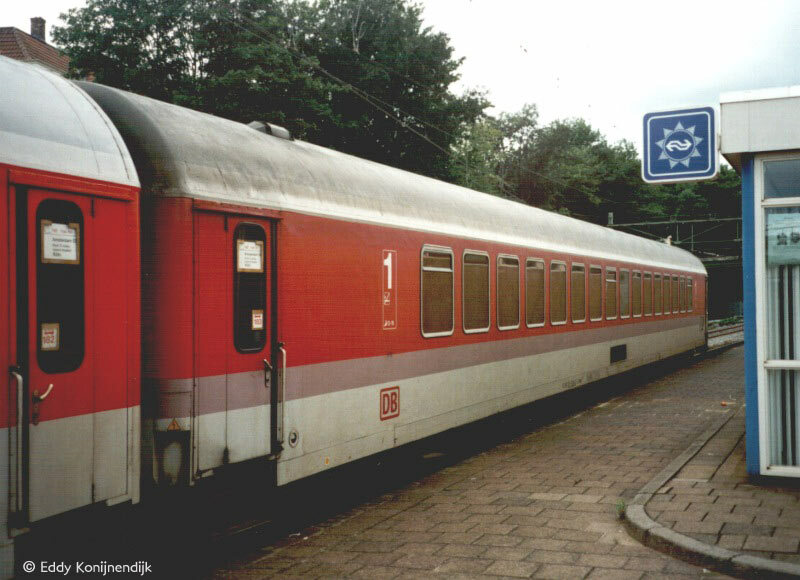 Intercitytrain in station "Berlin Zoologisher Garten", 1995. My first Berlin-photo! 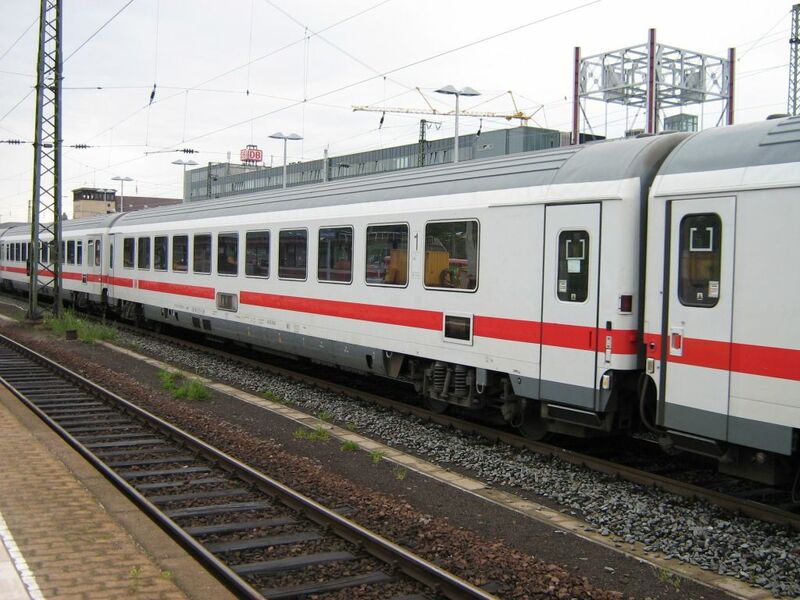 Typical at that time were the doublepack of type 218 locomotives in front of InterCity trains, since parts of the railway in Berlin still needed to be electrified. 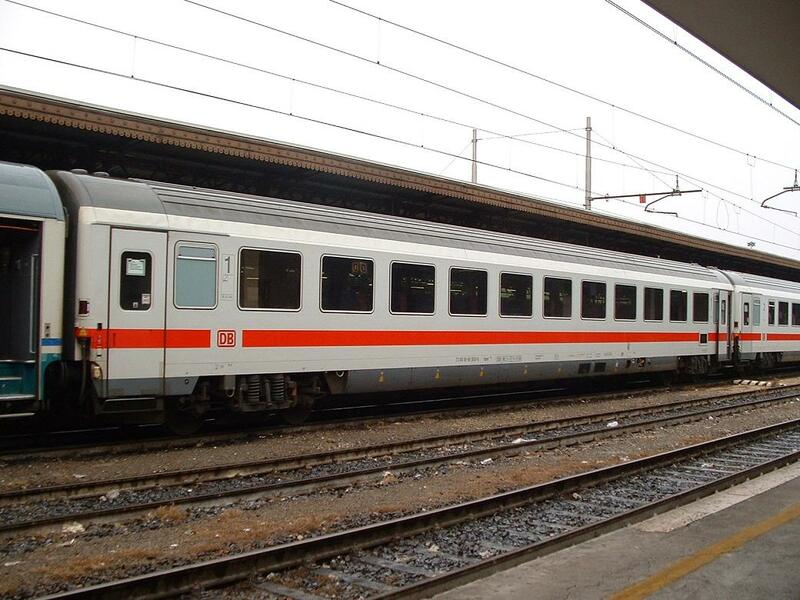 DB-AG: first class car 73 80 18-90 500-5 Apmz119.5 in EC 82 "Paganini" Verona Porta Nuova - München Hauptbahnhof. Verona P.N., 02/10/2005. 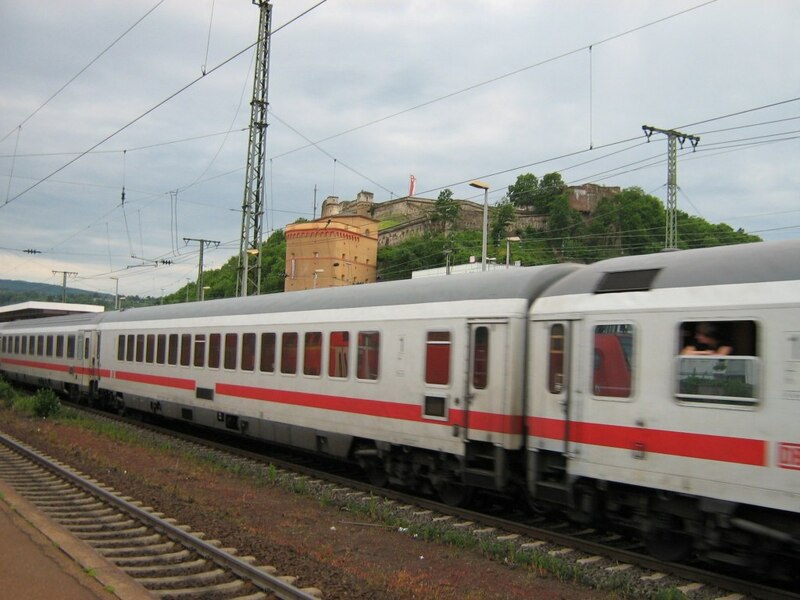 Final countdown for Paris-Frankfurt conventional daytime services (Deadline: 09/06/1007!!!). 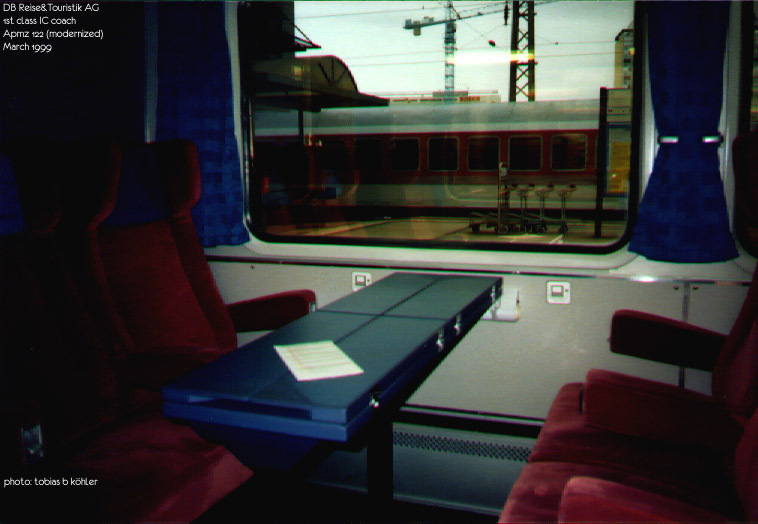 1st-class (Open-room) car (Apmz-119) of DB-FV, seen in the consist of EC 56 (Frankfurt Hbf ---> Paris Est), while leaving towards the French border. On that day, this car ran declassified to 2nd-class, as a relief. 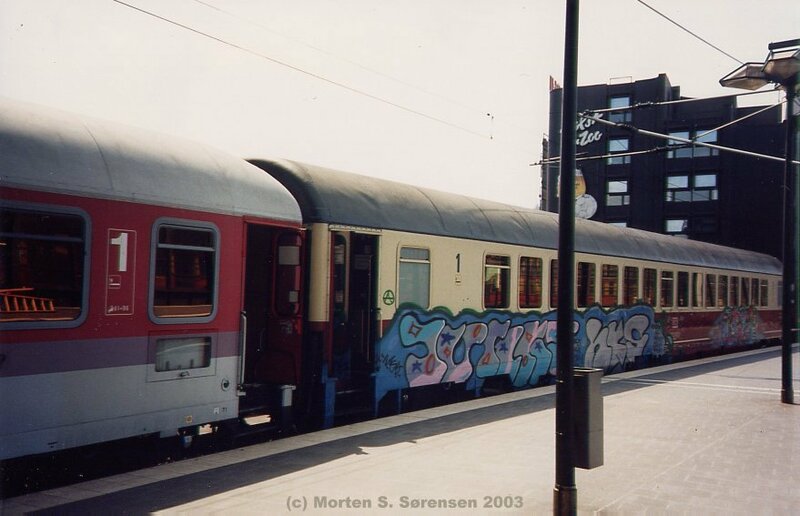 1st-class (Open-room) car (Apmz-119) of DB-FV, seen in the consist of the very last EC 67 ever (Paris Est ---> München Hbf), while calling at Strasburg. 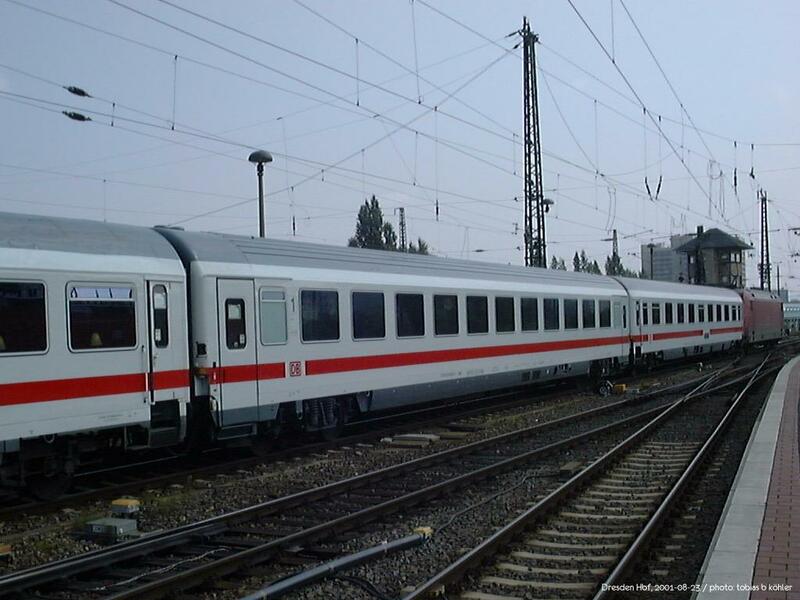 1st-class (Open-room) car (Apmz-121) of DB-FV, seen in the consist of IC 2213 (Oostseebad Binz ---> Stuttgart Hbf, via Hamburg, Duisburg and Heidelberg), upon arrival at Koblenz. 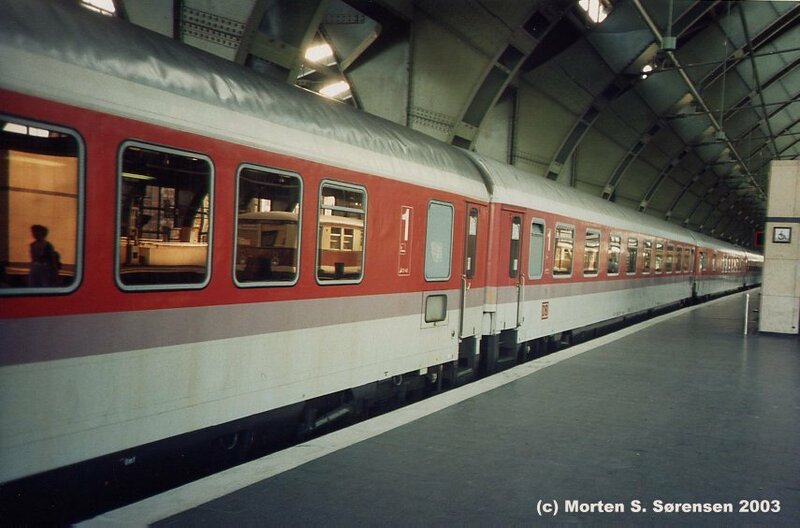 1st-class (Open-room) car (Apmz-121) of DB-FV, seen in the consist of IC 439 (Luxembourg ---> Dortmund Hbf), awaiting departure. 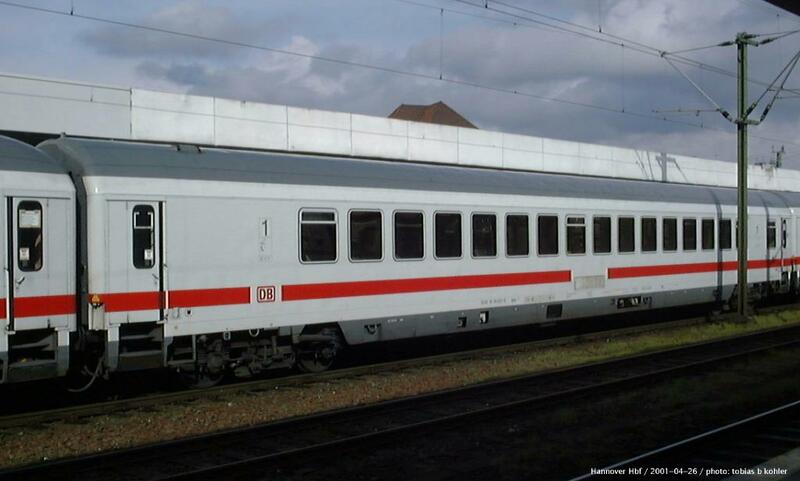 1st-class (Open-room) car (Apmz-121) of DB-FV, seen in the consist of EC 56 (Frankfurt Hbf ---> Paris Est), seen while leaving, after swapping its Class 181.2 of DB-FV with a Class 15000 of SNCF-VFE. 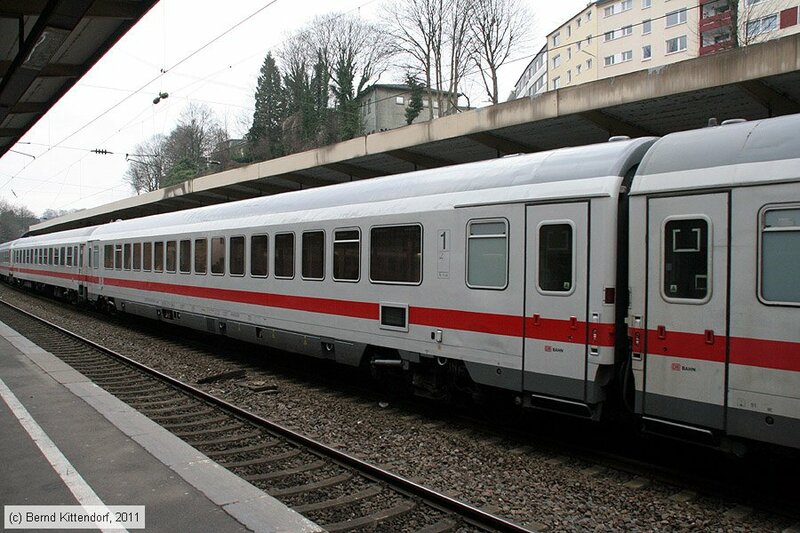 1st-class (Open-room) car (Apmz-119) of DB-FV, seen in the consist of EC 168/9 (Lyon Perrache--->Stuttgart Hbf). 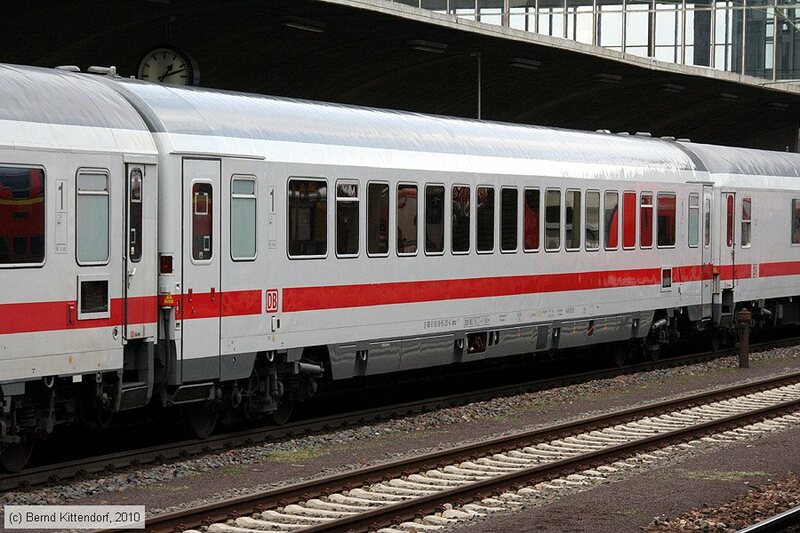 1st-class (Open-room) car (Apmz-119) of DB-FV, seen in the consist of EC 265 (Strasbourg--->Stuttgart Hbf). 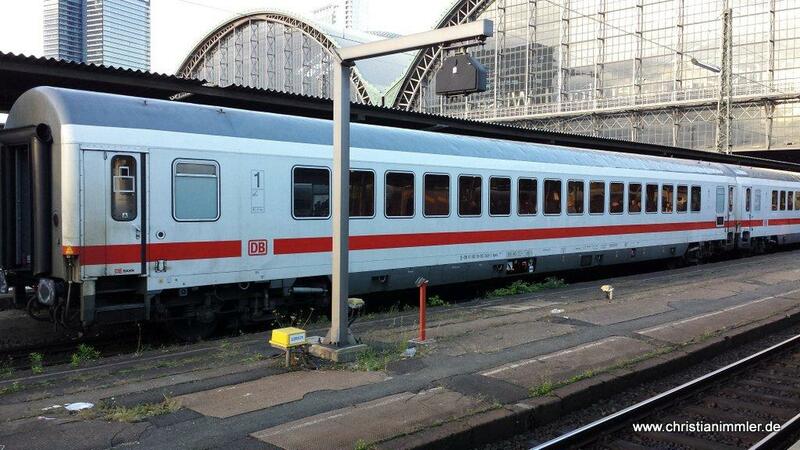 DB - Apmz119 73 80 18-90 506-2 with EC 81. 2007-08-10. Trento. Final countdown for IC/EC stock of DB in Paris (Deadline: 9th December 2007!!!). 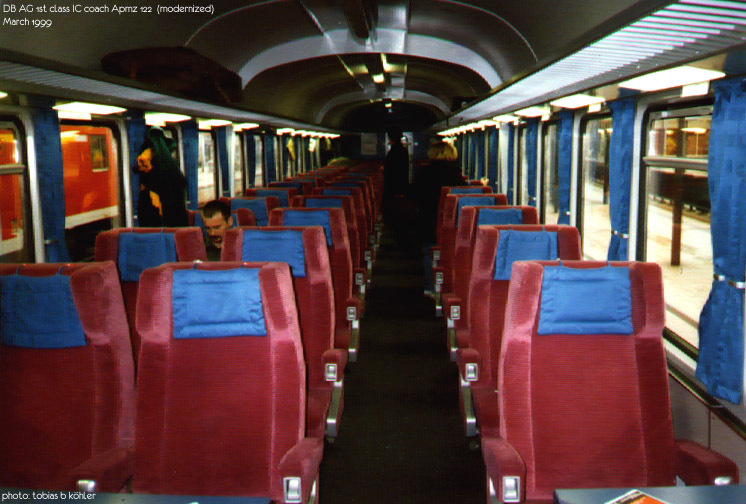 1st-class (Open-room) car (Apmz-122) of DB-FV, seen in the consist of EC 67 (Paris Est--->München Hbf). 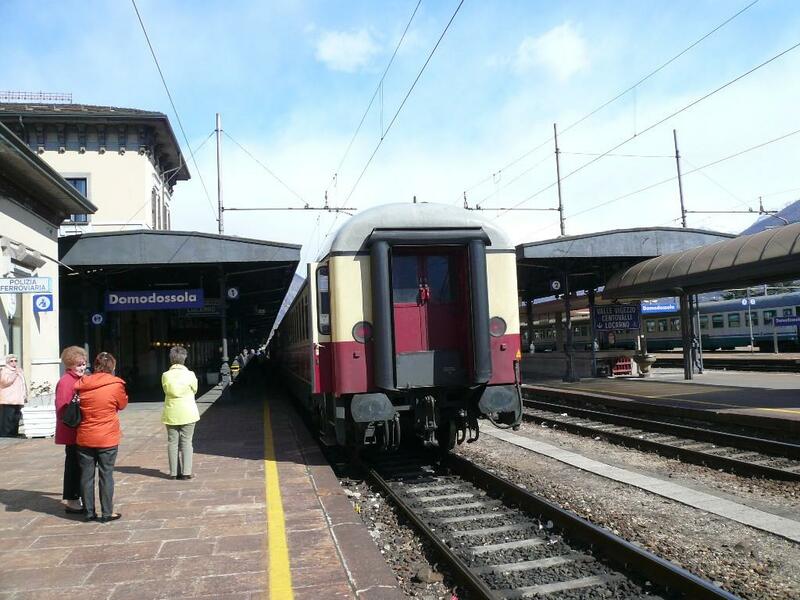 TEE "Rheingold" a Domodossola. TEE "Rheingold" at Domodossola. Wagen 61 80 18 90192-5 D-DB (Typ Apmz127.1) in Wuppertal Hauptbahnhof, aufgenommen am 16. Februar 2011. 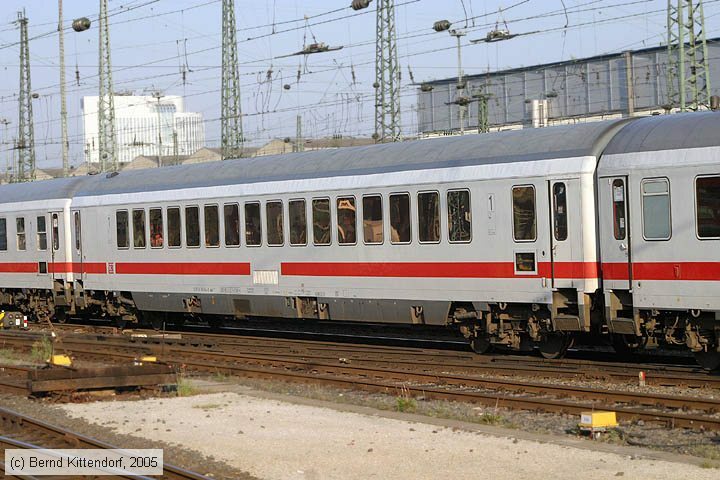 Wagen 61 80 18 90344-2 (Typ Apmz125.3) in Frankfurt (Main) Hauptbahnhof am 18. Mai 2005. 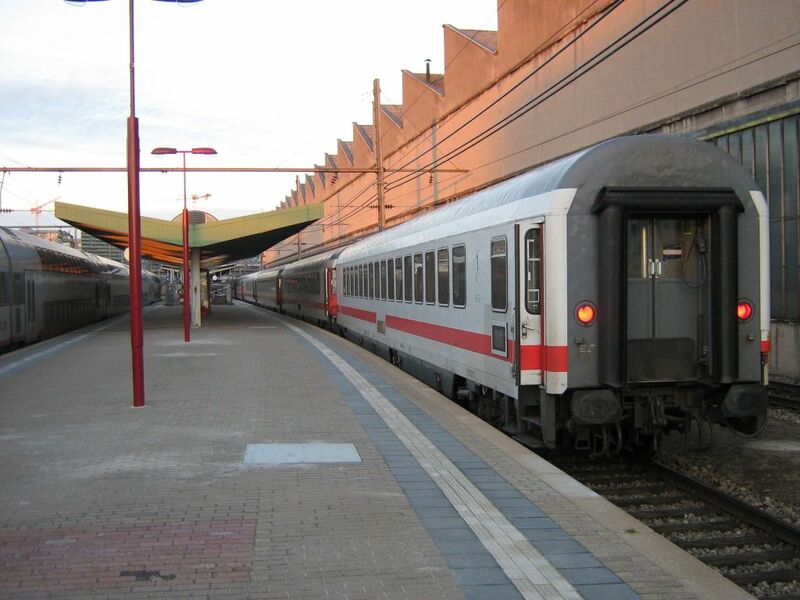 Wagen 61 80 18 90365-7 D-DB (Typ Apmz125.3), aufgenommen bei der Fahrt durch Ludwigshafen Mitte auf Gleis 2 am 30. August 2011. 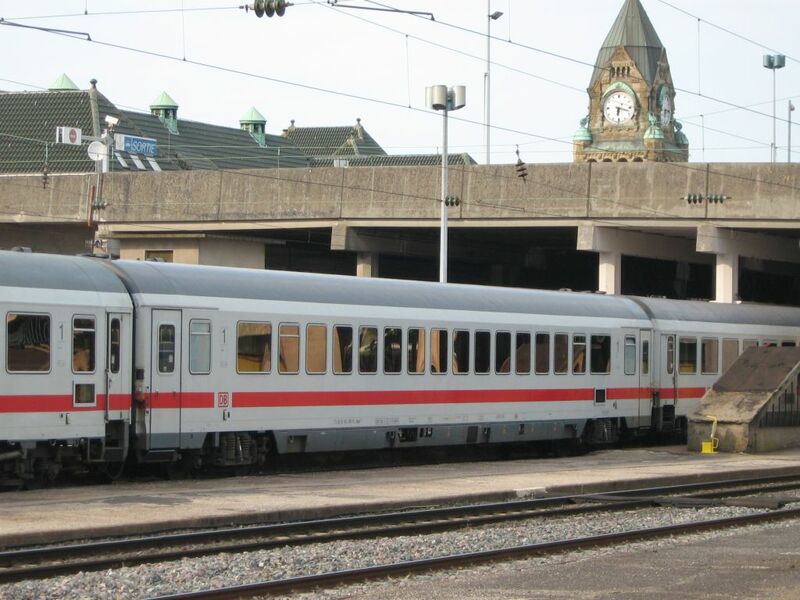 Zuglok war die ÖBB 1116 177-5. Wagen 61 80 18 95251-4 D-DB (Typ Apmz127.2) in Heidelberg Hauptbahnhof, aufgenommen am 05. April 2010. 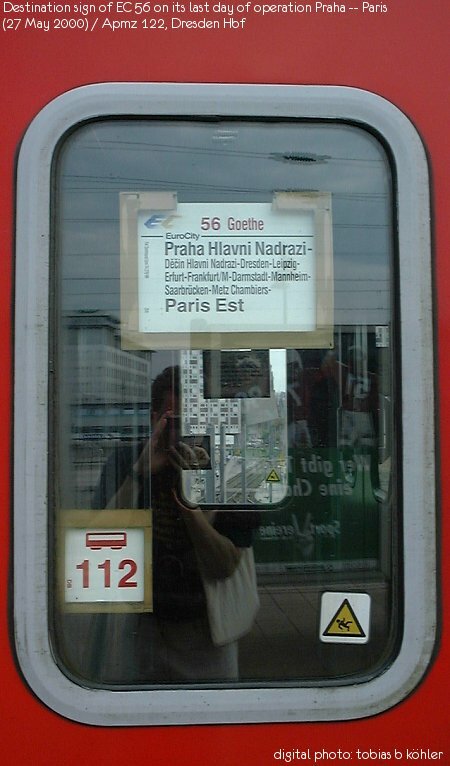 Destination sign of the EC 56 Goethe Praha - Paris on its last day of operation (27 May 2000), in a 1st class car Apmz 122.